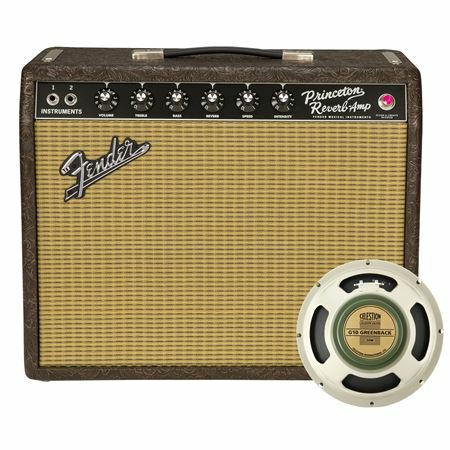 Shop Fender LE Exclusive Run 65 Princeton Reverb Western Greenback G10 from AMS with 0% Interest Payment Plans and Free Shipping. Brown faux-tooled leather vinyl covering, Wheat grille cloth and a Celestion Greenback speaker set this limited-edition amp apart! The new ’65 Princeton Reverb Amp offers today’s players all of the great tone and dynamics of the original…in an affordable, roadworthy reissue. The robust 12-Watt platform is a wise choice for creating tube tone in a small space, and even provides enough output for small gigs and rehearsals. Unique features to this amp include:. Also includes Special Edition badge. Quite possibly the PERFECT amp ! there are many versions of this amp....but I specifically wanted THIS one and AMS was the only place that had it in stock ( no surprise there ) !! It’s totally gorgeous to look at...came with a top quality cover and sounds unbelievable! .....especially if you’re a pedal guy like me ! Crystal clarion cleans....THE famous, classic reverb and the best tremolo in music history ! 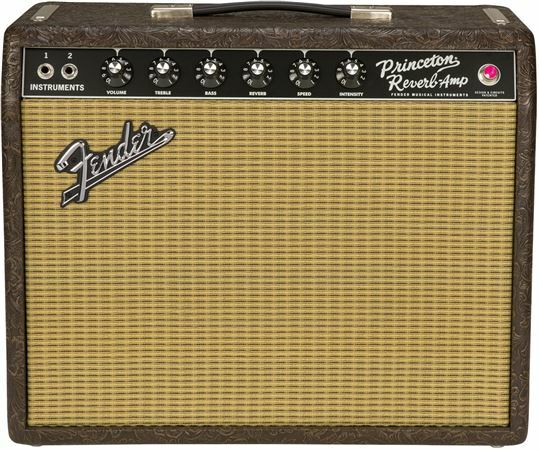 Mike Campbell of “Tom Petty” fame, when asked what amp he’d want if he could only have one...said, “I’ll take a Princeton every time” ....very good advice !!! I bought this amp because it was a limited run Princeton that had the all-so-important celestion greenback speaker. I sure am glad I did. The Princeton in stock form is a fantastic little amp, but the greenback gives it a slightly different voice, a little creamier sound, if that makes any sense. I feel it’s an improvement over the stock offering. It’s surprisingly loud if you crank it up- plenty of power for recording and small gigs. You could even mic it so you could get it’s signature sound if desired. The combo breaks up nicely without too much mushiness, even given the speaker change. The carved leather printed covering is a nice touch. I am of the opinion that they make the Princeton combo available with the greenback a permanent offering. Nice touch Fender! Great amp. Beautiful tone. I play an AVRI telecaster. Pairs wonderfully. Was on fence about which princeton to choose speaker wise. I am glad I went outside of comfort zone and tried the greenback-really strengthens the weak point of the princeton. Western tolex is nice, and wheat cloth really looks great on the blackface cosmetics. The reverb and clean sounds are legendary. Fit and finish are top notch. Great vintage sound. Clean crisp and attractive. One of a kind in a collection. I play mostly blues country and southern rock and totally fits the bill. Get one and you won’t regret it. 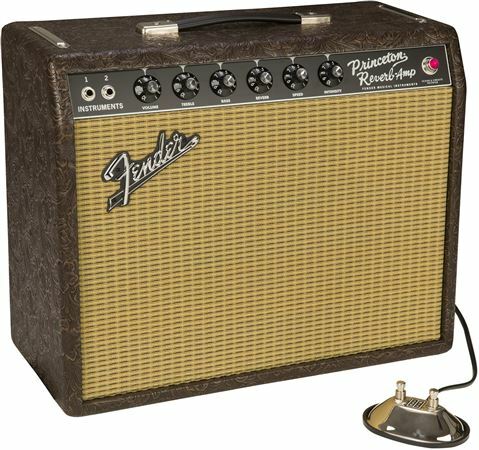 Classic Fender tone,worth every penny! .I have bought and sold line 6,Peavey,Egnater along with several other amps and settled on Blackstar ht 40 mkII which is a fantastic amp.But like many others found that it would get “close” to a Fender clean but not quite get there. So I decide to take advantage of AMS financing and get the real thing. W0W! When you want that Fender tone nothing sounds like the real thing, The c10 greenback makes this special, no flabby bass that comes with the stock Eminence. Classic reverb and tremolo,warm and totally silent,takes pedals very well,add a slap back delay and a your favorite dirt pedal and your set. Sounds great at acoustic dB levels and rips with the volume at 4-5.Takes humbuckers and really makes single coils sound great.It is true that Fender guitars sound best thru Fender amps..If you you can only have one amp this is the one to get. Very highly recommended! First let me thank AMS for great service and very speedy delivery. 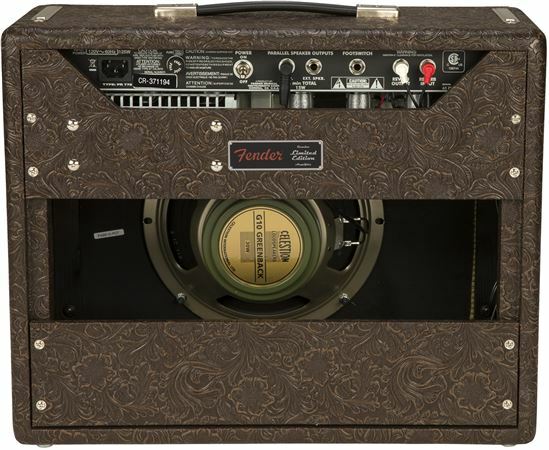 This amp looks fantastic in the western tolex and wheat grill cloth. As for sounds, I have a few amps and none of them have a reverb this lush. Same goes for the tremolo also. But the amp itself is very warm. I can not wait for the greenback speaker to work in because it already sounds outrageous. The build quality is great. I am very pleased with this purchase. Thank you AMS for your fine service. Hey, the payment plans make it possible to have the instruments I need.Peace guys.